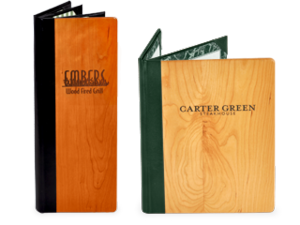 When selecting wood menu covers, you have a choice of ¼ inch thick oak, mahogany, or cherry wood front covers. The internal protective lining and back cover are made of sturdy and durable binders’ board. These menus truly stand out from other options. Thier solid wood design is not only pleasing to look at, but long lasting as well. Each menu cover also includes your restaurant's name or official logo carved into the front cover with laser engraving. Wood menu covers convey several things to your guests. Not only do they represent downhome charm and class, they also add a rustic feeling and a sense of the great outdoors which further enhances the atmosphere of your restaurant. 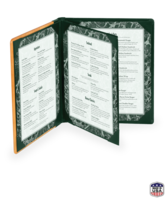 Wood menu covers are ideal for downhome cooking or rustic-chic restaurants. 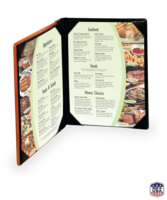 Wood menu covers are highly durable and last for years. These covers are crafted from the same quality wood you see used in housing construction. Because they are made of such sturdy material, wood menu covers last five years or more. Wood menu covers are easy to keep clean. To remove standard build up wipe down with a damp cloth. For stains or stubborn food residue, add one drop of mild strength dishwashing liquid for every six ounces of water to create a cleaning solution. Wipe the menu covers down to remove any leftover soap when finished. 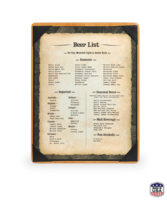 The menu covers are available in unlimited sizes, including measurements such as: 8 1/2 in. x 11 in. and 8 1/2 in. X 14 in., for single menus; 4 1/4 in. x 11 in., 8 1/2 in. x 11 in., and 8 1/2 in. X 14 in. for double menus; and 4 1/4 in. x 11 in., 4 1/4 in. x 11 in., 8 1/2 in. x 11 in., 8 1/2 in. X 14 in. for triple booklet-style menu covers. These menus use a wood stain finish with four different colors availble for you to choose from from light to dark tones. Wood menus cost a bit more, but are well worth the investment. They offer a durable and long lasting design that also enhances the image of your restaurant. Made from solid wood, these menu covers will enhance your restaurants earthy or rustic aura with their natural appearance that's easy to maintain.